I recently wrote about a good informal summary of genomic research in 2017 for geneticists. I found a more professional review article, How Asian nomadic herders built new Bronze Age cultures, by Bruce Bower, appeared in Science News (25th Nov. 2017). It refers to Kristiansen’s model, which we already know supports the expansion of IE languages with the Corded Ware culture, and a later Corded Ware -> Bell Beaker migration. This is followed by many geneticists today as “The steppe model”. 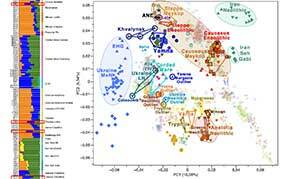 As Indo-European languages spread, the Yamnaya’s genetic impact in Europe remained substantial, even after the disappearance of Corded Ware culture around 4,400 years ago, Reich’s team reported online May 9 at bioRxiv.org. About 50 percent of the ancestry of individuals from a later Bronze Age culture, dubbed the Bell Beaker culture for its pottery vessels shaped like an inverted bell, derived from Yamnaya stock. 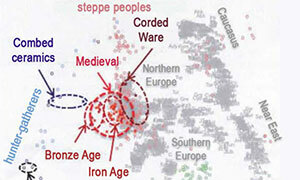 Such pottery spread across much of Europe starting nearly 4,770 years ago and disappeared by 3,800 years ago. 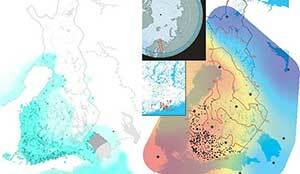 Migrations of either people or ideas may have accounted for that dispersal. NOTE. Anthony, as we know, has already changed his mind with the most recent data. Like many of his colleagues, archaeologist Volker Heyd of the University of Bristol in England was jolted by the 2015 reports of a close genetic link between Asian herders and a Bronze Age culture considered native to Europe. 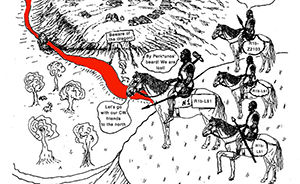 But, Heyd says, the story of ancient Yamnaya migrations is more complex than the rapid-change scenario sketched out by Kristiansen and Anthony. 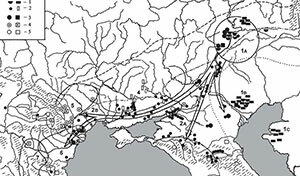 No evidence exists that Yamnaya people rapidly developed practices typical of the Corded Ware culture in one part of Europe, Heyd argues in the April Antiquity. Cultural shifts in Europe around 5,000 years ago must have emerged from an extended series of small-scale dealings with Yamnaya and other pastoralists, which was then capped off by a large influx of steppe wagon travelers, he says. 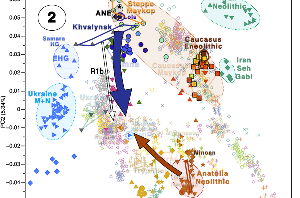 For instance, individual graves and other signs of contact with the Yamnaya people and even earlier Asian pastoralists appear in Europe 1,000 to 2,000 years before DNA-transforming migrations occurred. Consider that the Yamnaya account for 5 percent of the ancestry of Ötzi the Iceman, who lived in southeastern Europe roughly 300 years before the Yamnaya’s big move (SN: 5/27/17, p. 13). Little is known about those earlier encounters. Efforts to decipher ties between Yamnaya and Corded Ware culture are complicated by the fact that DNA is available from just a few people from each group, says Heyd, who is currently excavating Yamnaya graves in Hungary. Ancient DNA samples analyzed in the 2015 papers come from only a handful of Yamnaya and Corded Ware culture sites in a few parts of Europe and Russia. Heyd suspects that Yamnaya travelers had even earlier contacts, perhaps by 5,400 years ago, with central and eastern Europeans known for making globe-shaped pots with small handles. 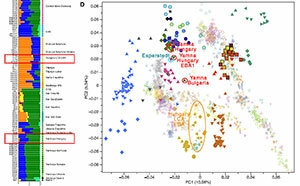 Individuals from that culture, excavated at two sites in Poland and Ukraine, possess no Yamnaya genes, a team affiliated with Reich’s lab reported online May 9 at bioRxiv.org. 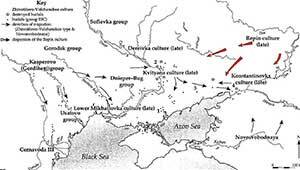 But Heyd thinks mating between members of that European culture and Yamnaya migrants may have occurred a bit farther east, where cross-cultural contacts probably occurred at the boundary of European forests and Asian grasslands. 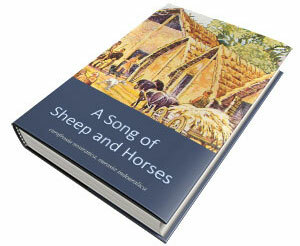 Other genetic clues point to a long history of Asian pastoralists crossing into parts of Europe. 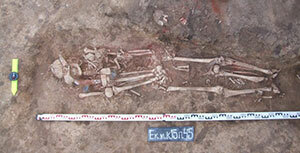 Small amounts of DNA from steppe herders, possibly the Yamnaya, appeared in three hunter-gatherer skeletons from southeastern Europe dating to as early as around 6,500 years ago. 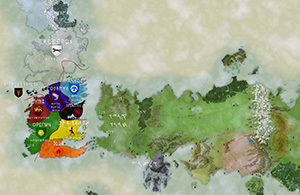 It is always interesting to see how reports gradually evolve, including more and more doubts about the ‘Yamnaya component’, and how it may be correctly interpreted. Slow but steady wins the race. Featured image: from the article, based on the 2015 papers and Kristiansen’s model.